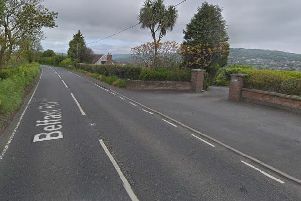 A man was remanded in custody today accused of breaking into a Co Antrim home in a bid to inflict knife wounds. Stewart Leckey, 23, appeared before Belfast Magistrates' Court in connection with an alleged attack in Whitehead early on Sunday morning. Police said a man aged in his fifties sustained a number of injuries during the incident at a property on Edward Road in the seaside town. Leckey, with an address at Ransevyn Park in Whitehead, is charged with aggravated burglary and attempting to inflict grievous bodily harm. He was allegedly armed with a knife at the time. Leckey also faces a second count of possessing a Class B drug, namely cannabis. A defence lawyer told the court he was not yet in a position to seek his client's release. "It was hoped to make a bail application, but there's no address outside Whitehead," the solicitor said. District Judge Harry McKibbin agreed to remand Leckey in custody to appear again by prison video-link in a week's time.